Metamorphosis Personal Training - Sydney is a health and fitness provider based in Western Sydney dedicated to helping people see transformation in their lives through health and fitness. 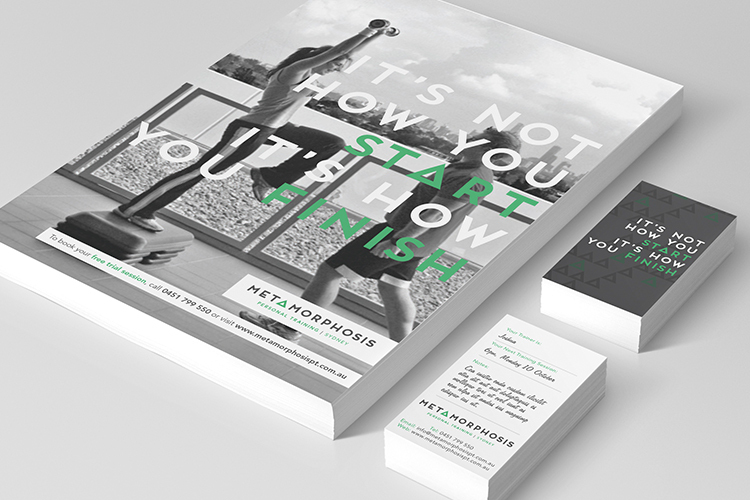 In light of launching a new range of products and services, including a new School Sports offering targeted at kids, Metamorphosis were looking to refresh their branding and create a system that tied their various programs together. From an initial brainstorm we developed the tagline "Change For Good" i.e: change that is both long-lasting and change that is for the better. This tagline served as inspiration for the refreshed brandmark - the feature triangle was inspired by the mathematic/scientific symbol for change - delta - or a triangle. This was then applied to a range of corporate and marketing collateral, everything from Corporate Stationery, Posters, Flyers, Appointment Cards, Fitness Diaries and more. Complementary logos were developed for 2 new products/services that they launched in 2013 - Morph-it Kids, a program targeted for school children and Shut The Fat Up! - a tongue in cheek approach to weight loss.